Give Mom the gift of entertainment with SM's e-PLUS Card, the most accessible way to watch movies. Watching movies gets even more convenient, rewarding, and fun as SM Cinema launches e-PLUS Card, its newest re-loadable card. 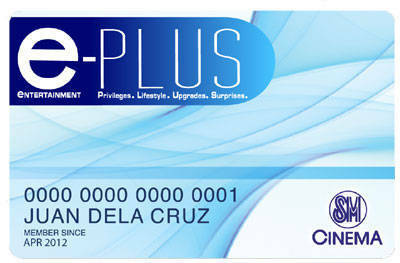 e-PLUS, which stands for Entertainment, Privileges, Lifestyle, Upgrades and Surprises, allows moviegoers to load credits on the prepaid card and easily upgrade it to a loyalty card for free. By upgrading it, cardholders can earn reward points for every use at any SM Cinema and Snacktime branch. The rewards are easily redeemable at e-PLUSbooths available in all SM Cinema nationwide. On top of the reward point scheme, e-PLUS is loaded with VIP privileges, special promos like a 50% discount on select movies, seasonal offers, quarterly raffles and invites to exclusive events. Partner merchants have extended exclusive and exciting offerings to e-PLUS members. Special e-PLUS lanes for reloading are available at the cinema ticket booth. Snacktime treats for members include free upsize of drinks and meal credits for every Php500.00 or Php1000.00 reload. Upon signing up, cardholders can also start receiving movie and promo updates regularly both via SMS and email. In addition, they can have their own e-PLUS account through the e-PLUS page at the SM Cinema website.